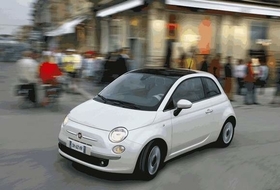 Italy is a net importer of cars such as the Fiat 500, which is built in Poland. TURIN -- Car production in Italy in 2008 is forecast to fall to levels not seen since the 1960s. Figures from the Italian automaker association ANFIA suggest that full-year production of new cars in Italy will slip by about 28 percent to 650,000 units from 910,860 in 2007. 693,695 cars were built in the country. 28,377 units. The fall was the second-largest production decline in 2008. In August, car production was down 92.8 percent to 2,180 units when Fiat's Italian factories had extended summer vacations. December production is expected to be down to 15,000 units from 45,410 units in the same month in 2007 because of temporary layoffs and extended Christmas vacations. In 1961, Italy was a net car exporter with a domestic market of 491,755 units. Last year, about 1.5 million of the 2.16 million new cars sold in Italy were imports. Of Italy's 10 best-selling models, just three are built in the country - the Fiat Grande Punto, Lancia Ypsilon and Fiat Bravo. The Grande Punto is Italy's No. 1 seller. The Panda and the 500, Italy's second and third best sellers, are built in Poland.